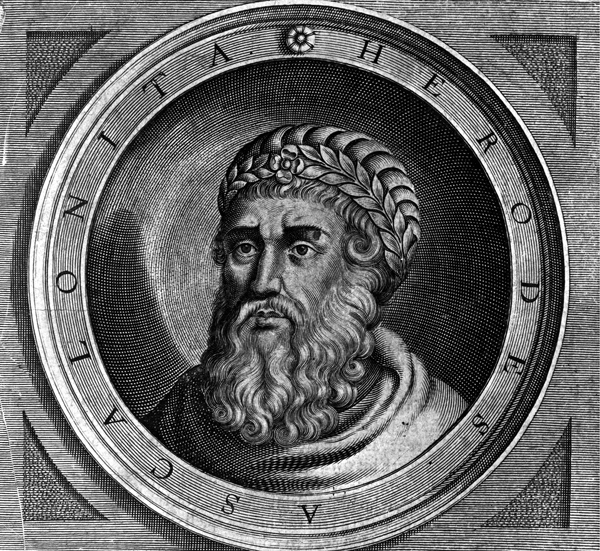 Herod to Pontius Pilate the Governor of Jerusalem: Peace. I AM in great anxiety. I write these things unto thee, that when thou hast heard them thou mayest be grieved for me. For as my daughter Herodias, who is dear to me, was playing upon a pool of water which has ice upon it, it broke under her, and all her body went don, and her head was cut off and remained on the surface of the ice. And behold, her mother is holding her head upon her knees in her lap, and my whole house is in great sorrow. For I, when I heard of the man Jesus, wished to come to thee, that I might see him alone, and hear his word, whether it was like that of the sons of men. And it is certain that because of the many evil things which were done by me to John the Baptist, and because I mocked the Christ, behold I receive the reward of righteousness, for I have shed much blood of others' children upon the earth. Therefore the judgments of God are righteous; for every man receives according to his thought. But since thou wast worthy to see that God-man, therefore it becometh you to pray for me. My son Azbonius also is in the agony of the hour of death. And I too am in affliction and great trial, because I have dropsy; and am in great distress, because I persecuted the introducer of baptism by water, which was John. Therefore, my brother, the judgments of God are righteous. And my wife, again, through all her grief for her daughter, is become blind in her left eye, because we desired to blind the Eye of righteousness. There is no peace to the doers of evil, saith the LORD. For already great affliction cometh upon the priests and upon the writers of the law; because they delivered unto thee the Just One. For this is the consummation of the world, that they consented that the Gentiles should become heirs. For the children of light shall be cast out, for they have not observed the things which were preached concerning the LORD, and concerning His Son. Therefore, gird up thy loins, and receive righteousness, thou with they wife remembering Jesus night and day; and the kingdom shall belong to you Gentiles, for we the [chosen] people have mocked the Righteous One. Now if there is place for our request, O Pilate, because we were at one time in power, bury my household carefully; for it is right that we should be buried by thee, rather than by the priests, whom, after a little time, as the Scriptures say, at the coming of Jesus Christ, vengeance shall overtake. Fare thee well, with Procla thy wife. I send thee the earrings of my daughter and my own ring, that they may be unto thee a memorial of my decease. For already do worms begin to issue from my body, and lo, I am receiving temporal judgment to come. For in both we stand before the works of the living God; but this judgment, which is temporal, is for a time, while that to come is judgment forever. End of the Letter to Pilate the Governor.